Neon Carrier von Moods Plateau für Amiga OCS/ECS. Veröffentlicht auf der Demoparty Revision 2017. 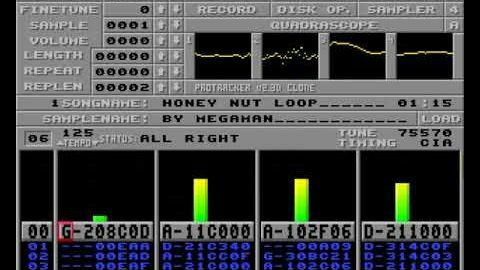 Musik am Abend: Honey Nut Loop by Megaman aka Brreeze – 100% Amiga Protracker! Former Commodore UK Managing Director David John Pleasance and Trevor Dickinson of A-EON Technology talk about the fall of Commodore and David’s upcoming book “Commodore: The Inside Story” Tomasz “ALT” Marcinkowski from the Polish Amiga Portal and Museum of Computer History in Katowice, Poland speaks with them at AmiParty 21 on August 12, 2017. In this video Skullator shows you how you can install your own custom SNES ROMS into the recently released Super Nintendo Classic Mini console.